It has been far too long since I featured an author interview, but I think you’ll agree once you read this one that it was worth the wait! Today I’m very excited to share a conversation with Stacey Lee, whose debut YA historical fiction novel UNDER A PAINTED SKY debuted last month from Penguin Putnam. It’s the story of two teenage girls in 1849 who escape their grim circumstances by disguising themselves as boys pursuing the Gold Rush via the Oregon Trail. It’s intense, gorgeously written, and has already garnered some amazing praise, including a starred review from Publishers Weekly. 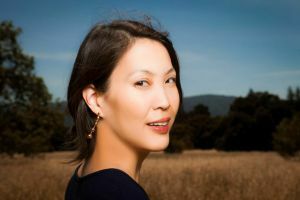 About Stacey: Stacey Lee is a fourth generation Chinese-American whose people came to California during the heydays of the cowboys. She believes she still has a bit of cowboy dust in her soul. A native of southern California, she graduated from UCLA then got her law degree at UC Davis King Hall. After practicing law in the Silicon Valley for several years, she finally took up the pen because she wanted the perks of being able to nap during the day, and it was easier than moving to Spain. She plays classical piano, wrangles children, and writes YA fiction. You can read more about her work at www.staceyhlee.com, on her Facebook page, or on Twitter @staceyleeauthor. AM: Welcome, Stacey! I first read your novel under a different title (GOLDEN BOYS), in my slush pile days at Nelson Literary Agency. It has been a huge thrill to see it debut, and to garner such well-deserved praise. Congratulations! To start off, can you tell us a little about where the inspiration for this story and its characters came from? My parents inspired me! My mother’s people came to the US in the late 1800’s, but due to the Chinese Exclusion Laws, Chinese people were not allowed to stay permanently. I always wondered what it would have been like for the first Chinese people in the US. My main character, Samantha, is born in New York, and has a toe-hold in both cultures, American and Chinese. I chose the vehicle of the western for my dad, who came to the US in the 1950’s when he was eleven, when the western was at its heyday. My father loved John Wayne movies, and would often play cowboy music for my sisters and I, so that was essentially the music of our childhood. I think, like many emigrants of that generation, the western appealed to him because in westerns, the hero is faced with an often-hostile country, and must go it alone. AM: What do you feel are the greatest pleasures and challenges of writing YA? I love both the awkwardness and the extreme-ness of that age. The teen years offer such a rich well of emotions to draw from, everything from anger and disappointment in parental figures, crushes, heartache, and it all feels SO devastatingly important and immediate. The challenges are to keep up the pace, not only to hook reluctant readers, but also because teens may not have the patience of adult readers who may stick with a slow starting book because they’ve heard the book got good reviews, etc. AM: As an editor, one of my favorite challenges is helping writers find the right place to start their story, and to make those opening pages as dynamic and engaging as they can be. Do you have any advice about this based on your own writing experiences? It’s important to get into the story as soon as possible. By the first paragraph, we should have a sense of time and place. By the end of the first chapter, we should have an idea of what the main conflict is (even if turns out to be something different). When I read, I always pay attention to how the author pulls us into the story, and I shamelessly incorporate those techniques into my own writing. AM: I love that advice. It’s not shameless, it’s savvy! You’re one of the team members at the We Need Diverse Books Campaign, which makes me an even bigger fan! Could you give our readers a glimpse of the project’s mission and your role in it? Absolutely. WNDB was created to address the lack of diverse, non-majority narratives in children’s literature. We believe that embracing diversity will lead to more empathy, understanding, and ultimately, equality. We have a ton of awesome projects we are working on; we’ve established the Walter Award, which will be given to the diverse author of a diverse book every year in honor of visionary Walter Dean Myers, we’ve partnered with major organizations like National Education Association to bring diverse authors to classrooms, we’re establishing an internship program at major publisher for diverse folks who want to go into publishing, we’re planning a huge Diversity Festival in 2016. So much good stuff ahead. I am the legal director, as well as the panels director; we all wear many hats at WNDB. AM: What can readers and writers do to help support We Need Diverse Books’ goals? You can be involved directly by volunteering. If you want to support diverse books and diverse authors, there are lots of ways to do this, including buying diverse books, requesting them at libraries, and telling your friends/families about the diverse books that you love. If you loved a diverse book, you should absolutely let your bookseller, and even the publisher know. They value and need this feedback. Take the time to review the book on Goodreads or Amazon. It doesn’t take too much time to rate a book, or to add it to your GR list. AM: Can you give us any teasers about your next project(s)? My second YA historical fiction will be out in 2016 and is called THE UNSINKABLE MERCY WONG: a spirited Chinese-American girl pretends to be an heiress from China to get entry into an all-white boarding school, but more than her future plans are shaken up when the 1906 San Francisco earthquake hits. AM: That sounds amazing! I’ll be looking forward to it. Thank you for sharing this news and all of your wonderful insight. Thank you so much for having me, Anita! Hello, Amy. I'm so sorry I missed your comment before. How wonderful that you are interested in being a part of the WNDB campaign. You can find out more by going to this link and clicking on "Get Involved": http://weneeddiversebooks.org Best wishes!